The publication of the latest I-16 research has sent those persons responsible for the condition just described into frenzied action. It is now possible, for the first time, to actually create a definitively accurate I-16 of one's favorite type. Two of the Master Modelers in this part of the UK, Peter Vill (VVS site Hero of Soviet Modeling winner) and Bob Patridge (whose work is also on display), have teamed up to make masters for the I-16 (and sundry other products; more on that in future). 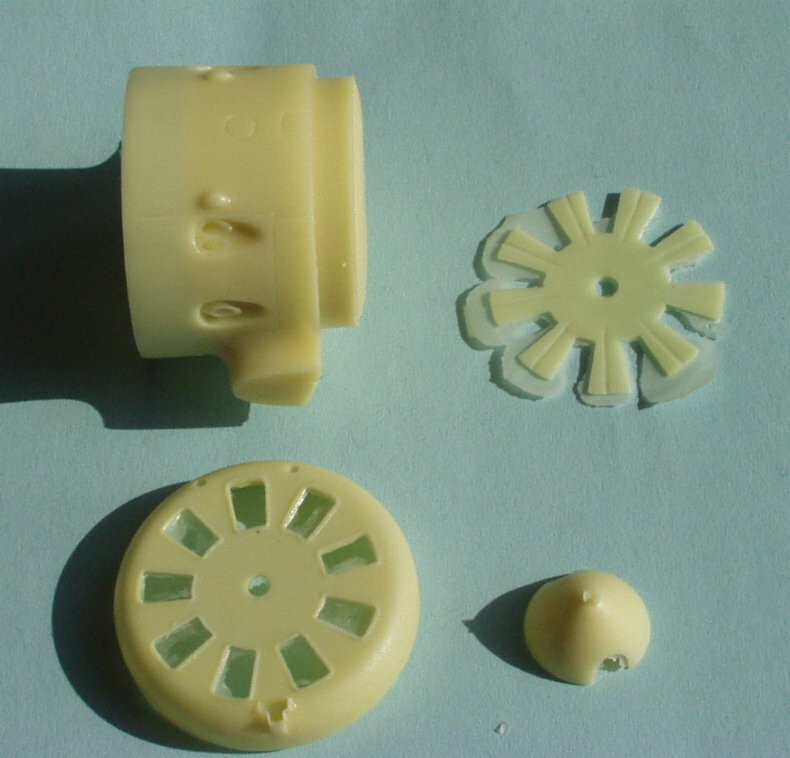 With such expert hands at work, it is inevitable that the result will be superior conversion parts which not only fit well, but that also feature very fine detail. Update: The first examples of the production unit have now been delivered, and true to form, these are as nice and crisp as we have come to expect from Airwaves resin. Indeed, the casting is quite exquisite. Below are two photos of the set, the first right out of the bag, and the next showing an assembled example in grey primer. New Update: Peter has been kind enough to supply these photos of a completed Airwaves Type 10 nose all painted and assembled. The silver bits are those not included with the set. Click on the small thumbnail to see a sheet of several pictures. The first of several resin releases from Airwaves for the I-16 will be a correction set to make a Type 10. The intended kit for this set is the ubiquitous Hobbycraft/Academy I-16 in 1:48. The Hobbycraft/Academy kit is basically sound in shape, and need only benefit really from some modern research to sort out some proper details and such. In this way, a very accurate I-16 can (and indeed has been; see our Model Gallery for some examples) be made using this kit. The Airwaves Type 10 nose set Master is an absolute masterpiece. The unit is offered as a plug, so that it fits into the model's fuselage with minimal fuss. This is accomplished by cutting the kit nose off along the very significant panel lines making up the edges of the cowling. Thus, no surface detail loss should occur at all. The fit of the replacement nose is utterly delightful, and even a ham-handed modeler like myself should be able to manage this with ease. The Airwaves nose is cast in several pieces. The main cowl and fuselage attachment fairings are all a solid piece, with the exhaust stacks beautifully cast in place. The cowling is hollow, and it does indeed accept the kit's engine (quite well, in fact) should you wish to install it. The surface detail is what we've come to expect from Airwaves-- superb. 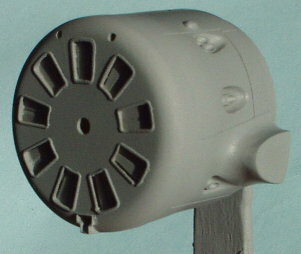 The cowl face is a separate piece that mounts onto the front of the cowling unit. 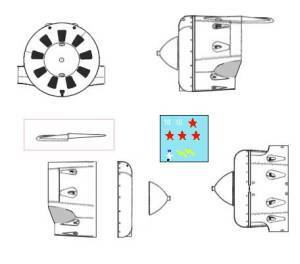 Before attaching this, the shutter plate is provided as well, and this may be displayed open, closed, or in any condition intermediate to that. Update: To keep prices down, brass tubing will not be provided in the conversion set. However, a set of decals will be provided, these with markings for several coluorful schemes. 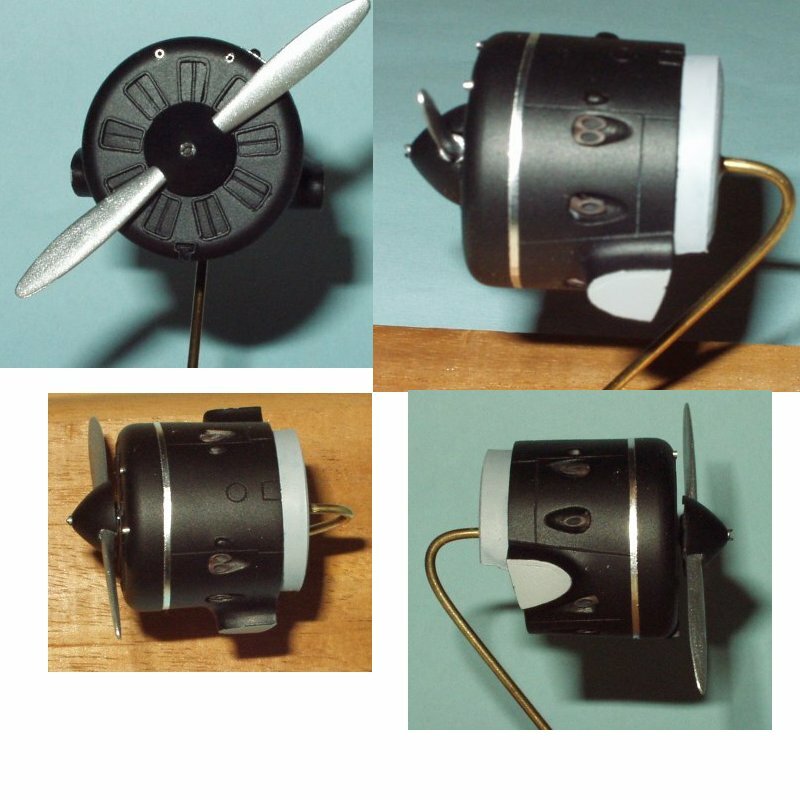 As well, a properly shaped spinner is included, and this fits expertly onto the kit's propellor. The hucks starter jig on the spinner is amazingly delicate, and has to be seen to be believed. The shape and features of this unit are simply unsurpassable. Every detail on the plug was fussed over extensively, and are quite accurate. Even the lower 'T' shaped oil cooler inlet has been faithfully recreated, and is most delicately molded. The Type 10 nose was selected because it best compliments the kit out of the box, and with essentially no further parts an accurate Type 10 can thus be completed. I cannot imagine any modler wanting to build an I-16 Type 10 in 1:48 Scale who will not want this set immediately, and I recommend this item unreservedly for any skill level. Indeed, this nose is so accurate, and fits so well, that I must again award a rare '100' score, simply because I cannot think of anything wrong with it. Very well done! Airwaves have made it clear that they are going to release a number of I-16 sets in 1:48. I have personally seen the Master for a correct Type 5 'normal' pattern wing (all of the Type 5 kits to date feature the improved 1938 wing). This unit is looking to match the Type 10 nose in quality, and appears to be absolutely superb. I cannot wait for this unit to arrive, because I (for one) am sick and tired of not being able to correctly model the large number of beautiful Type 5 schemes that we see all over (like Spanish Civil War, some Art Deco article examples, etc). These Type 5 wings are going to be joined by a Type 5 cowling, as well. What a treat it will be to see these items available for the I-16 at last. I have also seen prototypes for an I-16 interior set, and other sundry items. I will not even launch into a lengthy list of these at the moment. The Type 10 nose correction set is not yet in series production. This will occur very soon indeed, perhaps even as one reads this article. However, I strongly advise all interested modelers to place quantities of this plug on hold, lest they miss out! Airwaves boss Andy has generously agreed to take pre-orders, and can be reached via e-mail. Airwaves' web site may also be used, and is listed above. Demand is likely to be such that those who do not act fast might have to wait for a second production batch. I do not have current pricing or exact availability information, but I'm sure such details may be sorted out by e-mailing Airwaves. So, be warned, and get building.